FREE! Click here to download an excerpt from the new second edition. UPDATED AND BETTER THAN EVER! THE EXERCISE INSTRUCTIONS ARE MORE PRECISE AND THE SUPPLEMENTARY MATERIAL HAS BEEN REVISED. The Finis Jhung Ballet Technique: A Guide for Teachers and Students concentrates on the essentials for absolute and advanced beginners—of any age and body type—with an eye toward organic movement logic. Besides count-by-count instructions for every exercise, the author has fleshed out each exercise with time-tested, point-by-point descriptions and in-depth analyses which clarify the mechanics of movement and will enable you to turn mystery into mastery. 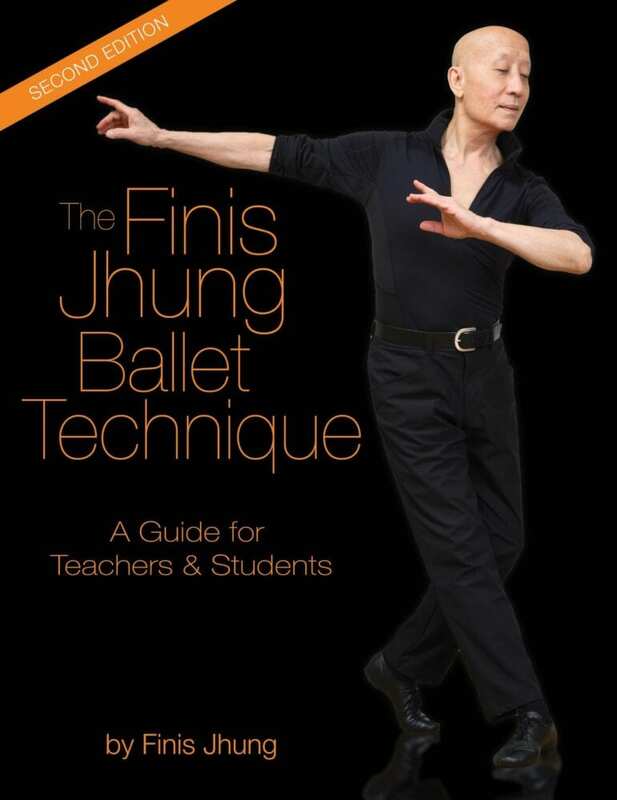 The book is not illustrated but provides detailed notes on every exercise demonstrated in the first four DVDs of The Finis Jhung Ballet Technique Series, as well as selected exercises from Ballet Plus, The Art of Teaching Turns, andThe Art of Teaching Jumps. Whether you use the book alone or with its companion DVDs, we are confident you will find the answers to your unanswered questions. Discover—or rediscover—the essentials of good ballet technique in this comprehensive, accessible book. Ballet has a reputation as a beautiful but intimidating art form, and those who lack natural flexibility or a typical dancer’s body may feel unwelcome in a ballet studio. In his first book, former professional dancer and longtime instructor Jhung dispels that notion, reminding students and teachers of the pure joy that dance can bring while offering clear guidance on how to move with grace and confidence—and avoid injury. jumps. Lessons begin with an outline of the specific movements and are followed by a detailed analysis of each exercise so that readers will understand why it’s essential to perfect simple steps before moving on to more complex choreography. These initial lessons are clearly explained and are easy to follow even for those with no prior ballet training. Throughout, Jhung maintains his encouraging, supportive tone while also discouraging the sloppiness and overreach that leads to strained, inelegant movement—valuable lessons for beginners and advanced students alike. A fresh, friendly guide that demystifies classical ballet while providing clear guidance on how to be a better dancer. “I am so grateful that you encouraged me to purchase your book! I had no idea that the book was so clearly coordinated with all the videos. It is a real companion to the videos and I can even see which videos I might benefit from in which order. But then there is the whole way your book is organized – with all the personal stories and with the development of your unique teaching method which just feels so right to me – and so original. I have never read of or heard of anything like it, and yet it makes perfect SENSE – to my body as well as my brain. I laughed while reading about the question ‘How do you walk?’ because I studied ballroom dancing for 10 years and teacher after teacher would ask the same question and explain it with ‘You walk by falling forward and then your feet catch you.’ And every time they said it, it just never ever made any sense to me. I thought I just must not be walking the way other people walk! As I read that section of your book with great interest, I could actually FEEL the correct answer – just by the way you were teaching! And I was so happy that I could SENSE the answer just before you validated it. Anyway, THANK YOU for encouraging me to purchase your book. If I had purchased only the videos, I would have missed so much! I have other books on ballet technique and they are nothing like what you have written.” – Anonymous from Berkeley, CA.